BenMar Farm is excited to present the Purebred Irish Draught Foals and Irish Draught Sport Horse Foals we have produced over the years. Please click on the photos or links to see more. Horses on this page were bred and raised by BenMar Farm but are not out of our Irish Draught Stallion, Bridon Belfrey. She is an absolute dream! Perfect limbs, tons of bone, great shoulder and top line. Bella is promising to have her Mama’s extraordinary movement! BenMar Sanibel, RIDSH was approved at her inspections in 2004 and now is a Registered Irish Draught Sport Horse Mare!! BenMar Banks Amadeus, IDSH passed his 2003 inspections with flying colors, earning these comments from the judges: "Highly Attractive Horse" and "Destined to do Great Things!" “Sonata” embodies the best of the Irish Draught and Trakehner breeds. Sonata’s sire, Banks Fee Daniel RID, has earned the coveted Fertility Award 7 years in a row. 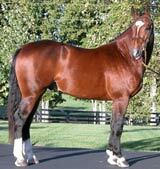 He is also one of only two Elite RID stallions in the world.